I can safely say that Pirates of the Caribbean: At World's End is the first Hollywood blockbuster this year that isn't a heaping pile of disappointment. In fact, it's actually quite entertaining, if you can get past the sometimes confusing ever-shifting allegiances of the main characters. actually requires the viewer to PAY ATTENTION. Yes, it's supposed to be confusing and, yes, you will be scratching your head at times wondering who's siding with who. You'll get over it. I'm steering clear of spoilers for the sake of this review, but needless to say, this film ties up all of the lose ends left dangling at the conclusion of last summer's Dead Man's Chest. The crew of the Black Pearl sets off to Davy Jones' locker to fetch Jack Sparrow (Johnny Depp). The East India Trading Company has possession of Davy Jones' heart and controls the Flying Dutchman, tightening their stranglehold of the oceans and putting pirates on the endangered species list. There's a call-to-arms, the pirates are assembling to fight back, and Disney executives are buying pants with bigger pockets. 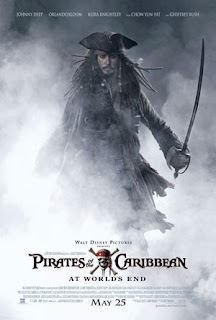 What I really enjoyed about this film was the reintroduction of Captain Barbossa (Geoffrey Rush), and his scenes with Jack Sparrow. These are guys that tried to kill each other two movies back, and now that they're on the same side, things get interesting. It's a constant power struggle between the two, and they provide some of the best scenes of the trilogy. I also appreciated Gore Verbinski's take on Davy Jones' locker. It's trippy fun as we get a glimpse into Jack's dementia. He's a captain without a crew on a ship with no ocean. Depp brings the character of Jack Sparrow even further into the realm of the bizarre, and the payoff is huge. You really can't write about a film like this without regarding the special effects. They're just incredible. Davy Jones and the crew of the Flying Dutchman never come off as digital creations: you completely buy the fact that they're on the set at all times. Kudos to Industrial Light and Magic for providing, in my humble opinion, some of the best computerized creations ever put to film. There's also the climactic whirlpool battle between the Pearl and the Dutchman that puts a proper cap on the trilogy. It's dizzying, it's exciting and it's exactly what you're looking for in a popcorn flick. AWE ends in fitting, yet near-tragic fashion, tying up the relationship between Will Turner (Orlando Bloom) and Elizabeth Swann (Keira Knightley). I applaud the filmmakers for not going for the sickeningly cheery route and opting for something bittersweet. As for Jack, the film leaves things open for a fourth but it is not yet known if Depp will be donning the bandana and braids once again. However, I have a sinking suspicion that for the right price, be it dollars or dubloons, Jack Sparrow will sail again.